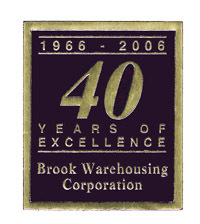 Founded in 1966, Brook Warehousing Systems has been steadily growing their operation to provide logistics solutions for all industries. With modern facilities throughout NJ, Brook offers over 500,000 square feet of public/contract warehousing space for Bonded, Chemical, Pharmaceutical. Our warehouse management systems is dedicated to receiving, warehousing and distributing our customers' products according to their exact warehousing requirements and instructions. A sense of concern and responsibility for the environment and safety of our fellow Brook associates. A spirit of cooperation and teamwork within the Sales, Customer Service, Warehouse Operations, Technology and Regulatory Compliance departments to achieve the highest levels of customer satisfaction. An acknowledgement that our associates are the company's greatest assets. A dedication to Continuous Improvement by enhancing all lines of communication throughout the organization and with our customers. Industries served: logistics Solutions, NJ Chemical warehousing, Pharmaceutical warehousing, general merchandise distribution, food service warehouse and other services to manage your supply chain.